alaTest has collected and analyzed 13 reviews of Lenovo IdeaPad A1 22282EU 7" LED 16GB Slate Tablet. The average rating for this product is 4.4/5, compared to an average rating of 4.3/5 for other products in the same category for all reviews. We analyzed user and expert ratings, product age and more factors. Compared to other products in the same category the Lenovo IdeaPad A1 22282EU 7" LED 16GB Slate Tablet is awarded an overall alaScore™ of 82/100 = Very good quality. At such a great price I thought why not?! I am very happy with my purchase. It works great for all my computer needs and my kindle all in one! Cannot stop raving about it. I am a very happy customer. This tablet is great. It takes a couple of minutes to start up but once it is running it is fast enough. The battery life is good, about 6 hours on a bright screen. Many fun apps. available and movie are great to watch on this little tablet. The best value for a tablet. 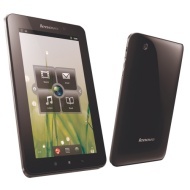 Light weight, the screen size is perfect for reading, browsing internet, games, and access to many Android Apps. Heavy storage capacity, beautiful design, brand recognized, i like it.